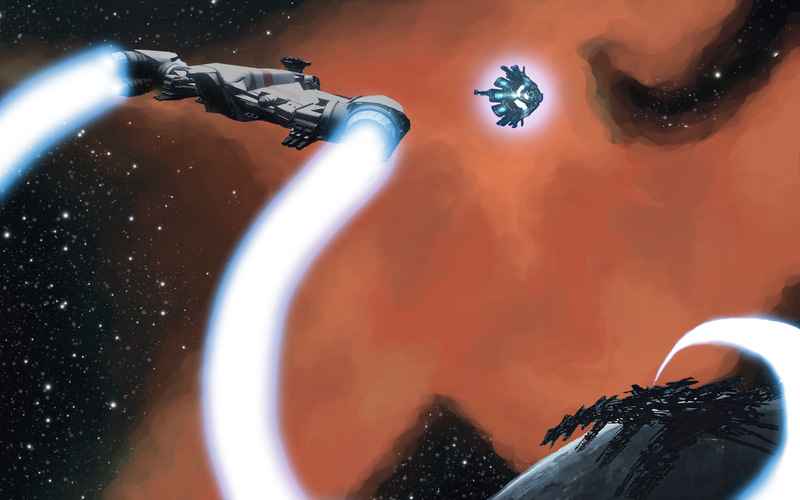 The original idea was to have our Cutlass (Havik) leaving Spider and flying towards some sort of beacon which was the jump point. I took some models and concept art from around the internet to set up the basic composition. 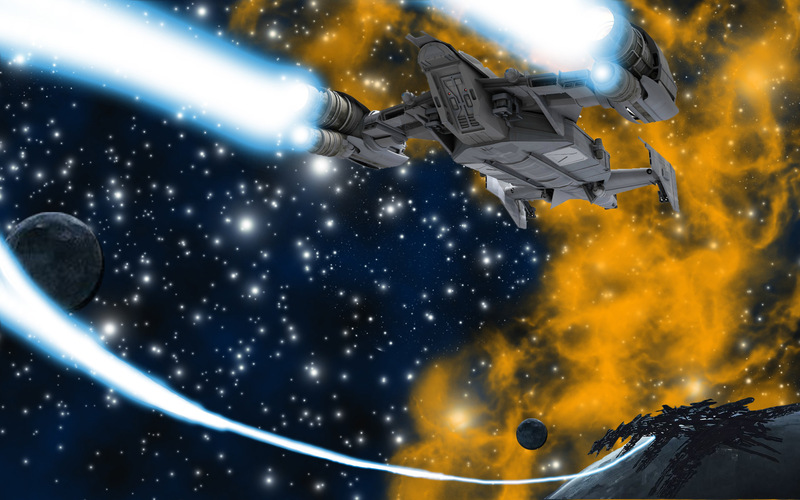 I wanted to have our ship swooping out and back into the frame, showing it’s movement with the engine trails. 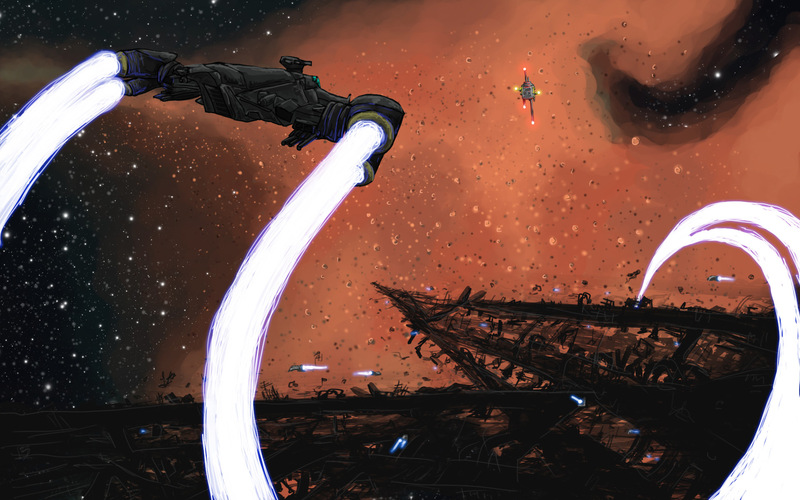 I started hand drawing the space and nebula background under what was a more finalized composition. After that was set up I started drawing all of the other components for the actual drawing. I started experimenting with how the engine trails should look as well. Here is a closeup of different versions I tried. 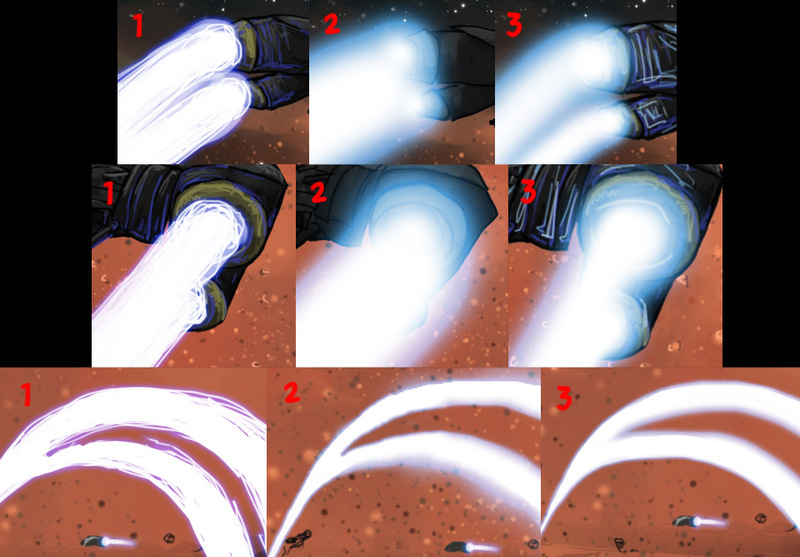 1 is a more lined hand drawn look, 2 is an almost completely digital look, and 3 is the final. The look of the trails has evolved in later panels, which I will discuss in a future making of. I also had to decide how Spider might look from this distance. 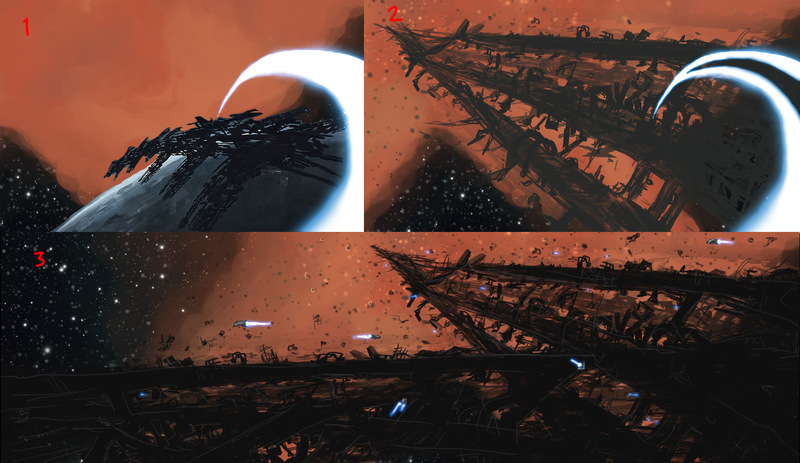 Since it is a floating mass of wrecked ships welded together, I simply just took my design and layered variations of it on top of itself with varying opacity. 1 is cut from a very early official concept art of Spider which I used to set the original composition. 2 was my first design of the twisted metal and debris forming a city. 3 is the final version which was darkened and layered to give it more depth and more scale. 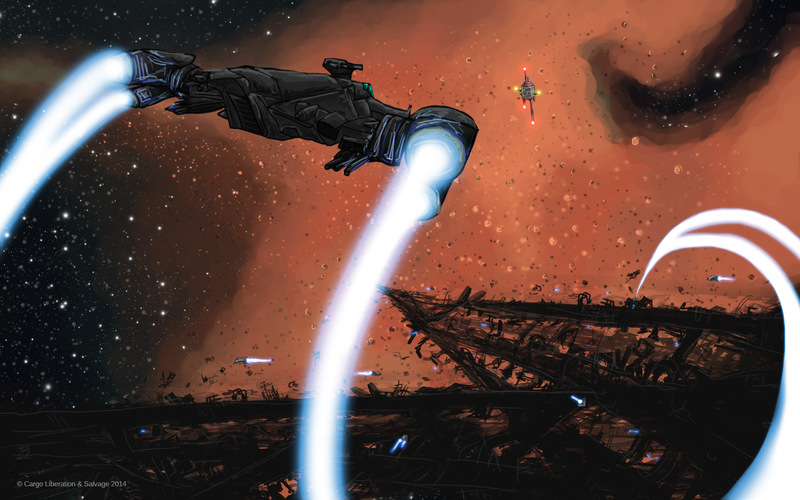 Note that I enlarged the ship itself a bit to make it more of a focal point. That is all for this week’s making of blog post, I hope you all enjoyed this small glimpse into the making of panel 4. Next week I will show what went into the design of the cargo ship that Rekks and Jace have assaulted as well as more of the evolution of my engine trail designs. 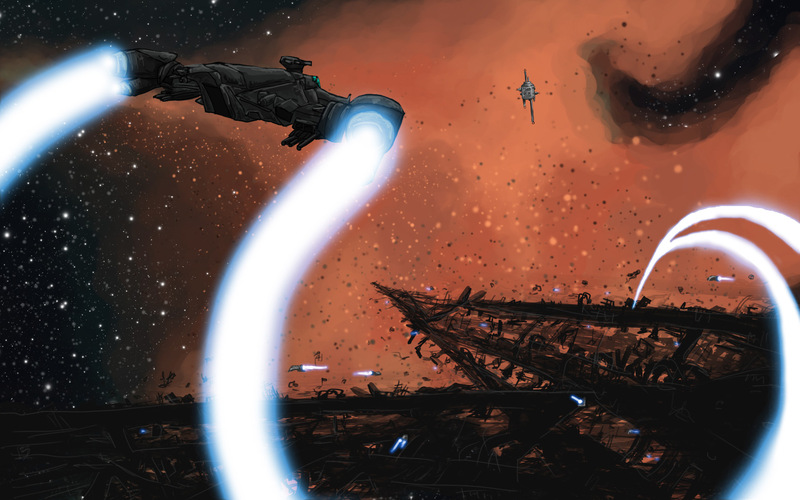 The Making of Concept is as much fun as the comic itself very interesante.